Some things just go better together. 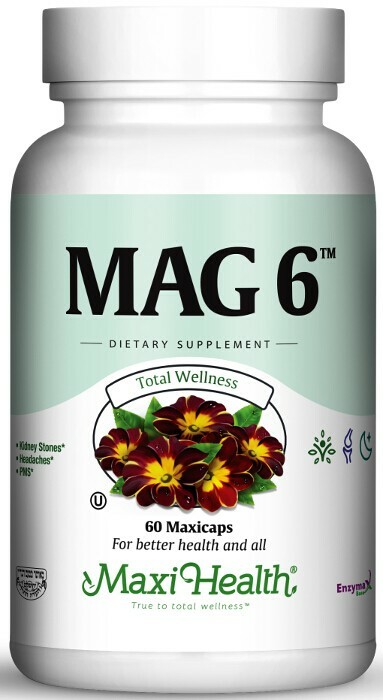 That’s why Maxi Health offers you our Mag 6™, Magnesium and Vitamin B6 together. Magnesium offers the body support for cell detoxification, muscular relaxation and blood vessel flexibility. Keep in mind that your heart is the most important muscle in your body. See for yourself how these two important ingredients support your health when working together. Try Mag 6 today! Take on (1) maxicap™ in the morning with breakfast or as directed. This product contains no animal products, wheat, gluten, salt, milk, yeast, soy, artificial flavors, colorings or preservatives.